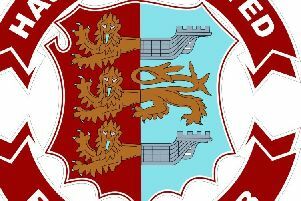 Little Common player-manager Russell Eldridge was pleased to extend the football club’s unbeaten run to six matches despite not playing particularly well in Saturday’s 2-2 draw with Shoreham. An 88th minute goal from Jamie Crone ensured the Commoners picked up a point from their latest Southern Combination League Premier Division encounter. They remain 15th in the table. Eldridge said: “I think the way the game was in the end, after going behind in the second half, we’re happy to get the one point and obviously keep that unbeaten run going. I think that was important. “We’ve previously spoken about how the performances have been good and the results. Today the performance wasn’t good enough, but we’ve managed to get a result - or a point to keep that run going. “We’re disappointed because we didn’t play anywhere near as well as we could’ve done. I felt we were a bit lacklustre and lacked a little bit of quality in the first half with our decision making and passing, but we huffed and puffed, and managed to get something out of the game. “It was a good start, a good goal from Jamie, great finish. Maybe we took our foot off the pedal a little bit. Crone has scored four goals in Common’s last two games having also netted twice in last week’s Sussex Senior Challenge Cup victory away to Horsham YMCA.